In Salou we found a ready mixed lager and lime, now we have had these before but this is the first one that was drinkable. 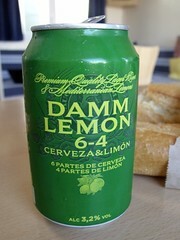 Damm, Damm Lemon from Spain. 3.2% it does what it says on the can, it's a lager and lime and at a good price. It tastes exactly like what you would get in any pub in England if you asked for a lager and lime, not for me at all but Dot likes it.